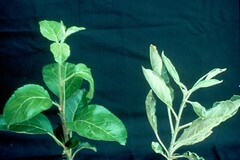 Powdery mildew causes whitish lesions on curled or longitudinally folded leaves (fig. 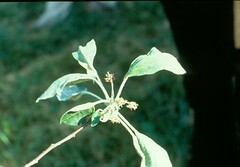 1), stunted whitish-gray twig growth evident on dormant shoots (fig. 2), and fruit russeting (fig. 3). Economic damage occurs in the form of aborted blossoms (fig. 4), reduced fruit finish quality, reduced vigor, poor return bloom, and lower yield of bearing trees and stunted growth and poor form of nonbearing trees. Figure 1. Powdery mildew on shoot on right showing whitish fungal growth on curled and folded leaves; healthy shoot on left. Photo: K. S. Yoder, Virginia Tech. Figure 2. 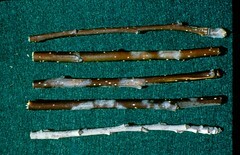 Whitish-gray mildew on dormant apple twigs; healthy twig at top. Photo: archives of A. B. Groves, Virginia Tech. Figure 3. Fruit russeting due to powdery mildew infection of the blossom. Photo: K. S. Yoder, Virginia Tech. Figure 4. Mildew-infected blossom cluster. Photo: K. S. Yoder, Virginia Tech. The mildew fungus overwinters mainly as mycelium in dormant blossom and shoot buds produced and infected during the previous growing season. As they emerge from infected buds at about tight cluster stage, the unfolding leaves produce and release conidia. Conidia germinate in the high relative humidity usually available on the leaf surface at 50°F to 77°F, with an optimum temperature range of 66°F to 72°F. Germination does not occur in free moisture. Early-season mildew development is affected more by temperature than by relative humidity. Abundant sporulation from overwintering shoots and secondary lesions on young foliage leads to a rapid buildup of inoculum. Secondary infection cycles may continue until susceptible tissue is no longer available. Since leaves are most susceptible soon after emergence, infection of new leaves may occur as long as shoot growth continues. 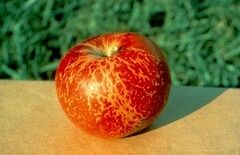 Fruit infection occurs from pink to bloom. Overwintering buds are infected soon after bud initiation. Heavily infected shoots and buds are low in vigor and lack winterhardiness, resulting in a reduction of primary inoculum at temperatures below -11°F. Where mildew-susceptible cultivars are grown, include a mildewcide in the scab program to control both diseases. The DMI fungicides are effective against both diseases. Begin sprays at tight cluster and continue until terminal growth stops. Early season sprays (tight cluster to petal fall) are essential if mildew is to be managed successfully. Lower rates of fungicides on a 7-day schedule are more effective than higher rates of fungicides on a 10-day schedule. For more information, see Table of Apple Cultivar Relative Susceptibility to Powdery Mildew. Adapted by Alan R. Biggs, West Virginia University. Original text prepared by K. S. Yoder, K. D. Hickey, and A. R. Biggs. The original version of this article appeared in The Mid-Atlantic Orchard Monitoring Guide (NRAES-75) and is reproduced with permission from the Natural Resource, Agriculture, and Engineering Service, Cooperative Extension, 152 Riley-Robb Hall, Ithaca, New York 14853-5701, U.S.A. (607) 255-7654.